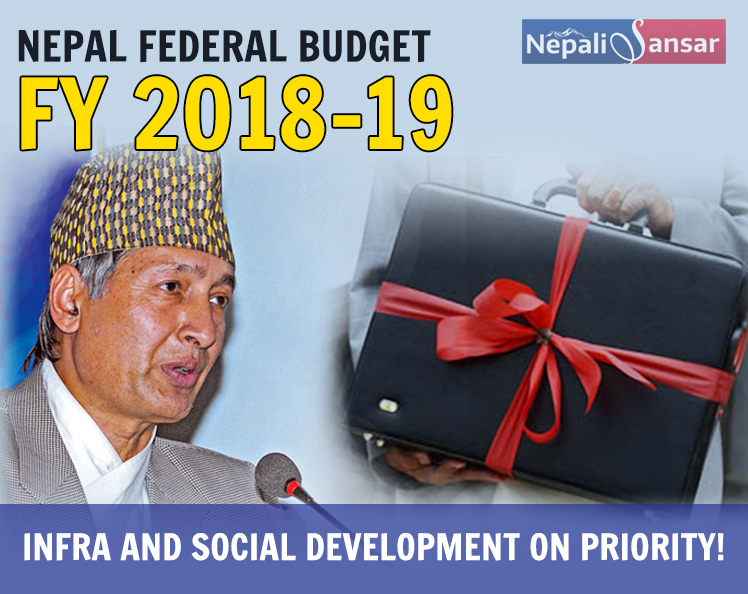 The most-awaited first federal budget of the Nepal Government is finally out on May 29, 2018 making a strong pitch for the socio-economic development of Nepal. 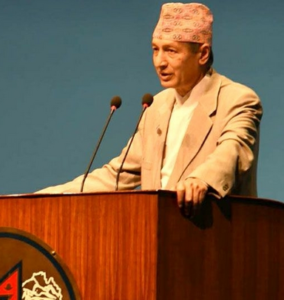 In a landmark move, Finance Minister Yubaraj Khatiwada presented the country’s Rs 1.31 trillion (Rs 81, 750 crore) budget for the Fiscal Year 2018-19 in the Federal Parliament. 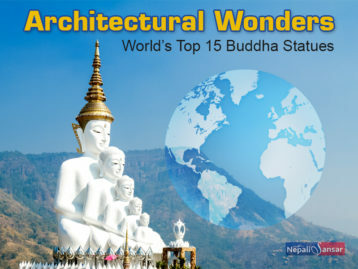 Making a strong pitch for infrastructure development, the new budget by the Oli-led Nepal Government brought some significant changes towards adding more revenue to the government treasury, job creation, tackling inflation and FDI, along with a special focus on strengthening local bodies and domestic industries. 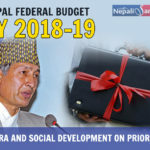 Economic Growth: Through the latest budget FY 2018-19, the Government of Nepal is aiming at an 8 percent economic growth in the next fiscal. Here it is noteworthy that the economic growth projection for the current fiscal remained at 5 percent in contrast to the government’s expected rate of 7.2 percent. Rs 3.5 lakh/annum to 1 percent tax. Allocation to Provinces: The new budget laid special focus on strengthening of local bodies in a move towards achieving overall development. 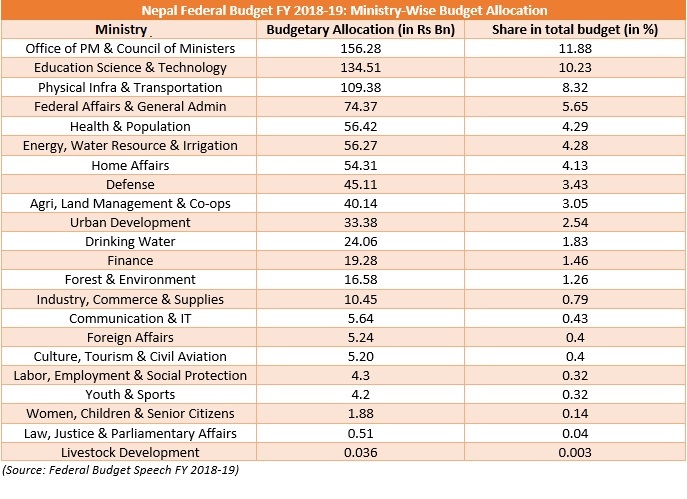 For the first time in Nepali annual budget history, the new government allocated separate funds for development of provinces. The financial resource allocation will be done in three different forms as grants, conditional grants and project finance. Besides, separate allocations were also done for special hi-profile projects enhancing transport connectivity. Education: Continuing the past trend, the education sector received the highest budgetary allocation in the Federal Budget for FY’19. In line with the global norms to dedicate 20 percent of a nation’s overall budget to education, the new budget saw the allocation of 10.19 percent (Rs 134.5 billion) of the total budget to the Ministry of Education, Science and Technology, compared to 10.09 percent of the previous fiscal. The budget envisages development of a technical school across all local bodies along with goals to attain free and compulsory school education gradually, access to high-speed Internet across every public school and achieve 100 percent literacy in two years. Creating Jobs: In a move strengthening the country’s employment portfolio, the new budget pitched for creation of more employment opportunities across the country. According to the Finance Minister, the government is looking at creating around 500,000 jobs in the coming fiscal. This number draws significance in the wake of current scenario where large number of Nepali youth are moving abroad for career opportunities. Healthcare: Healthcare is key to any country and Nepal is no exception. Nepali healthcare sector saw an allocation of around Rs 56.41 billion in the new budget for FY 2018-19, up from around Rs 32 billion of the previous fiscal. Under the development plans, the government plans to ensure free basic health services and setting up health centers with at least one doctor across all local governments. Expansion of the health insurance program across the nation and free essential medicine are among plans for the government. Luxury Items: The new budget called for hike on bikes with engines more than 150cc and cars with engines above 2,000 cc. Terming such vehicles as luxury items, the government said such vehicles would have negative impact on the country’s foreign reserves. 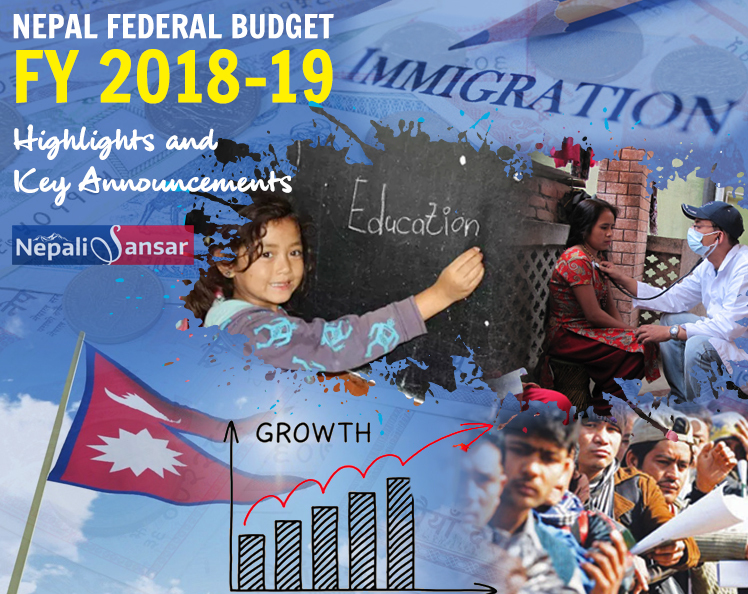 Immigration: In a move promoting local talent and wooing its migrant populace, the Federal Budget announced a project loan of upto Rs 1 million for returnee migrants depending on their skill-set. As part of the fiscal budget, another Rs 700,000 has also been allocated to youth population as a loan supporting their education. Continued... Infrastructure Gets Major Push! 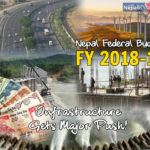 Nepal Federal Budget FY 2018-19: Infrastructure Gets Major Push!